Alex was playing a short piece I just finished writing called Skedaddle. (It's downloadable here.) She's doing the World Premiere at our Halloween Recital next weekend. We weren't happy with Alex's eighth notes. They were garbled and murky. Since she was playing a piece I had written, I wanted to make sure it was comfortable to play and sounded good! I was looking for a way to consolidate Alex's energy on her eighth notes. I wanted her to have the experience of playing those notes with a firm finger. But her fingers weren't firm. Instead of continuing to complain about the mushy fingers, I handed her two tall Ticonderoga Pencils. 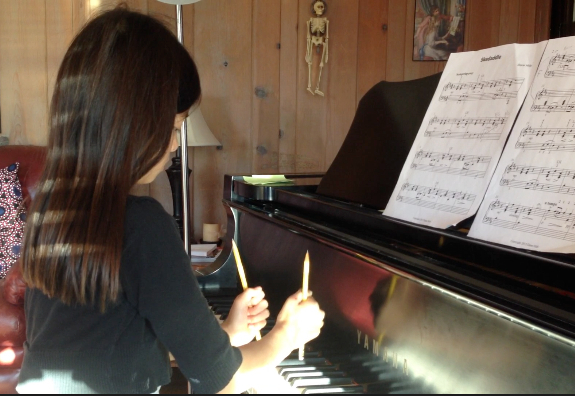 I asked her to play the left hand part of the piece using a pencil in each hand. Erasers down, of course! No harm being done to the instrument. The eraser itself also mimics the kind of traction a student might feel at the tip of their finger. When she used the pencils to play, Alex could only use large arm muscles to move her hands, but her attention was focused on each single note. In the process, she had to reorganize her motor planning. Watch the entire video. It has a false ending for reasons which will become clear. Compare her demeanor and enthusiasm at the beginning and end of the video. How does her coordination change as a result of playing with different tools than her fingers? Can you see a change in her motor planning? Do you think this is a trick she might try at home? When a student isn't able to do a task, we need to change the experience they are having so they can better understand what they're supposed to do. Simply asking them to do it slower, faster, louder, hands alone, or while counting out loud doesn't fix everything. Need some great ideas for your studio?